If you say it fast--it sounds more ambiguous. I observed a teacher today doing a lesson on volume. I was in there to see him in action using his Smartboard, as a "field trip" for the teachers I was doing some instructional coaching with. During the lesson, in which students were expected to measure several different objects and use the formula for volume to do their calculations, this teacher did something I thought was awesome. He held up the textbook. Then he said, (and I paraphrase here) "Anybody recognize this? It's our textbook--I know you haven't seen it before but here it is." The textbook was one of the objects students could choose to measure. I talk to teachers A LOT about standards based content and skills. Often, that is confused with the RESOURCES that one might use to TEACH the content skills. This comes up in curriculum mapping all the time--teachers are comfortable with a particular resource, and have a hard time separating the "HOW" from the "WHAT." A resource is a part of curriculum practice, but it is NOT the cornerstone of curriculum design. Traditionally, the book is the only resource a teacher considers in order to teach the content and skills necessary to master what is outlined in the standards. I think this is significant. I wondered to myself what would happen if we cleared the school of books. (We don't have to "Bradbury" them a la Fahrenheit 451, just move them...) What would THAT class look like? If it was the teacher I observed today, the class wouldn't look any different. I think I'm going to start using that as my new catch-phrase and say things like, "What if you 'Bradburyed' the situation?" or "You know, we could 'Bradbury' this whole scenario and start fresh from the ground up." I saw something this past week that I had to share: effortless technology integration. I was working in a district in Kannapolis, North Carolina—at their middle school—and I spent a day doing some classroom observations. I was trying to gauge the “pulse” of the building, but also find out what kinds of technology they had and how they were using it with their students. This school system recently received a large technology grant and have been providing teachers and students with lots of different technologies, including Mimio boards, Student Response Systems, projectors, laptops, document cameras, lots of software, etc. I’ve had the opportunity to observe teachers in many schools over the last few years, and anytime new technology is introduced, there is always that wave of fitting the content to the tool, rather than choosing the right tool for the content. It’s not necessarily a bad thing, let me say that right off the bat. There has to be a learning curve and time to become comfortable with all the new stuff that’s out there. Then, as time goes on, and the comfort levels go up, new technology hopefully takes its rightful place as a choice resource. 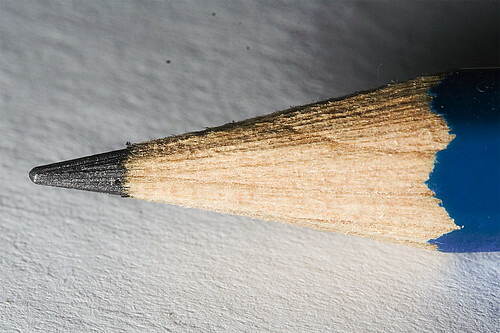 I look at it like this: at one time, a pencil was new technology. It was created for a specific purpose and even today, still has a place as a tool for a job when a pencil is required. (#2 pencil requirement, anyone? Anyone? Bueller?) But then, wouldn’t you know it, the technology got better. After the pencil came the pen, then the multi-colored pens, then the magic marker, then the $2,000 Mont Blanc professional grade pens—all doing similar jobs, but for different purposes and in different contexts. Sound familiar? When I walk into a classroom and see students writing with any one of a number of different writing utensils, I don’t “oooh” and “aaaah” over the different pens and pencils, because they are specific to the task at hand and show that students (and teachers) can have a preference over which writing tool they’d like to use and still come out with similar products or attain similar objectives. The report written in blue ink is no different, content wise, than the one written in green ink, or the one typed on a typewriter or computer and printed. So, back to the beginning of the post, the point of all this—is that this is how I saw technology, meaning computers, student response systems, document cameras, etc. being used at Kannapolis Middle School—seamlessly and effortlessly. Content and skills were the dominant factors, and the teachers and students chose the right tools from their toolboxes to maximize learning and reach their collective objectives. I watched a teacher use a Student Response system, and then question by question, regroup the students in the moment to work with proficient peers. I watched a teacher deliver Essential Questions through PowerPoint at the beginning of a class, which might sound a little pedestrian, but this teacher anticipated responses and uncovered additional information in the moment to redirect her students. I watched as a teacher toggled between maps and photos when delivering a Social Studies lesson on the naming of towns in the Southwest in regards to their proximity to established missions. I also got to see a couple of student teachers who were comfortable enough with different technologies (and allowed to pepper their instruction with them!) to take the plunge and use them, if for nothing else than to help engage and motivate the students. All of these teaching moments could have been taught with a myriad of different resources and these teachers chose a technology tool over other tools and, in my opinion, looked like they made the best choice. In short, the technology did not seem like a forced tool. It was like a pencil. These teachers and students were choosing the right tools for the job they had to do, not just using technology because it’s the 21st century or because they had to. Perhaps that’s what all this 21st century technobabble is all about: choice. It’s not about getting on every technology bus. It’s not about this laptop or that Flip cam. It’s about being comfortable enough to make the right decision (or maybe the habitual decision?) about what fits the content of the instruction in such a way as to make attaining your curricular objective easier. Perhaps that tool is a computer, or maybe it’s just a pencil. Whatever it is, Kannapolis Middle School seems to be doing it the right way. Seamlessly. Effortlessly. Effectively. Wonders of Wordle, The MOVIE! Addictively-fun and simple-to-use online photo effects. Upload photos, create something funny, and share them with your friends. Based on an earlier blog post, I thought I ought to write a little more to clarify what my thinking is around being data-informed rather than data-driven. Please note that this is not research based at all, it is simply my own thoughts around doing what I think is best for students. There are many factors to consider when developing a portrait of what a child knows and is able to do. Assessment data alone, especially in the form of state level testing-a once a year, one-shot deal-I don’t think should be the sole determining factor of future instruction or intervention. Now, I’m not saying that it is like that everywhere, but there is definitely a push in recent years to let this test or that test dictate things like Intervention Services, Ability Groupings, and possibly even Promotion. I know the evidence has to be there to inform direction…it’s what formative assessment is all about. All I’m really saying here is that the information that is gathered to direct a student’s educational pathway should be multi-faceted. The assessment data should be just a piece of the puzzle, particularly if the assessment data is coming from just one place. We teach our students to gather multiple pieces of evidence before drawing conclusions. Shouldn’t the teachers be doing the same thing? Besides state test data, we can look at local data, formative data (collected from classroom teachers). We can look at how a student has historically performed. We can create instructional paths based on interest and readiness, or on deficiencies that a multiple-choice test might miss. I’m just not a big fan of the “bottom line” mentality. We’re teaching humans, not machines. We measure to inform, not dictate, and we should be making instructional decisions, I think, based on multiple factors. When I say “data-informed,” that’s what I’m thinking. Coaching Chronicles: What is an Instructional Coach? Today is the day it all starts in Western New York. For most teachers, it was their day to go back, and for a select few, it was the day that kids started back. By next Tuesday and Wednesday, everybody in the state will be back in. The beginning of school has always been exciting for me--it's new, it's full of possibilities, and it begins a new year of experiences that will guide my future path. I'm already beginning my reflective process now and thinking about the things that I want to guide me in my practice this coming school year. Based on recent conversations with colleagues, with teachers, with administrators, and with my Virtual Learning Community, I'm seeing the value in being "data-informed" rather than "data-driven." I think it's important to appreciate all of the pieces of the puzzle to develop direction and make the biggest differences in what people know and are able to do. I want to continue to facilitate conversation and collegiality with those I work with. Conversation is the most important part of REALLY and TRULY making a difference. I want to help teachers understand that evidence is a good thing. Evidence for the Skills and Content that are taught are another important piece of "data informed" learning. I want to continue to develop quality versus quantity, meaning that I want to continue to build sustainability and continue to help teachers build their own capacity. I want to continue to develop a framework around supporting intern teachers, particularly with 21st century skills and the development of truly helpful learning communities. I'm writing this primarily for myself, as I give myself a "Direction for Reflection." I like being able to look back at the road map, and seeing if I'm still on the journey I intended to take, and if not, use these goals as a guide to get back on track. Here's to good beginnings! I hope you all have a great 2009-2010!